Girl power movies are a dime a dozen. From feel-good tween movies to women asserting themselves in the workplace, cinemas have been toying with the sub-genre for decades. But never has it reached such heights of perfection as in Ridley Scott's (yep, still shocks me that he's the helmer here) Thelma & Louise, the oft-homaged and endlessly entertaining adventures of two women who've had enough of being pushed around by men. 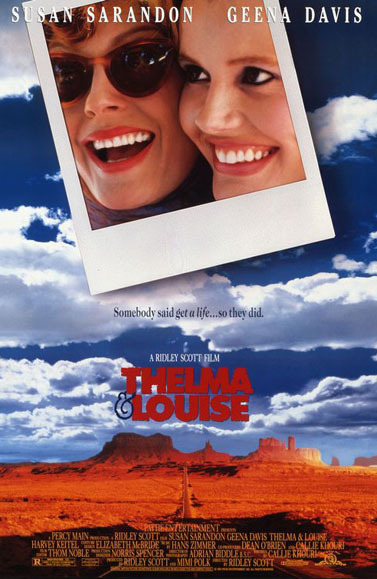 The cross-country adventure brings our two lovable outlaws to the edge of the desert, and Susan Sarandon and Geena Davis prove incredibly capable of endearing us to the hard-on-her-luck waitress and the good-time girl looking for a way out of her loveless marriage. Sarandon is even and solid as a rock as the brains of the operation, while Davis is gleefully insane in her party girl habits - both ladies more than deserved their Lead Actress nods that year. And thanks to one memorable final moment, the movie will go down as one of the treasurers of the '90s.